Since 2011, Montgomery Hair have built a strong, loyal client base in Helensburgh. With the belief that ‘hairdressing is more than just a haircut’ they are constantly evolving their ability and tecniques to deliver the best service possible for each and every client. Montgomery Hair were looking a solution to reduce the number of missed hair appointments, and the lost revenue that goes with them. They started using the Textlocal service in the salon to send their clients appointment confirmation texts. Montgomery Hair found the option of bulk texts to specific client groups a valuable marketing tool for quick promotions on quieter days. Within 4 days of reminders they had already recouped £112.00 in what would have been lost appointments. 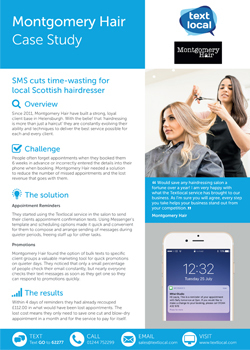 Download and find out how Montgomery Hair have managed to reduce their amount of missed appointments using SMS reminders. Would save any hairdressing salon a fortune over a year! I am very happy with what the Textlocal service has brought to our business, as I’m sure you will agree every extra step you take helps your business stand out from your competition.